The met station is expected to collect data for a period of two years. Suzlon Group, along with associates, commissioned their first Operational Offshore Met Station in the Arabian Sea. Suzlon group is actively working on offshore wind energy technology and has initiated techno-commercial feasibility study. Under the guidance from National Institute of Ocean Technology (NIOT) Chennai and approvals through National Institute of Wind Energy (NIWE) Chennai, Suzlon and its associates have installed their first Operational Offshore LiDAR (Light Detection And Ranging) based wind measurement station in the Arabian Sea, south west of Jakhau port in Kutch, Gujarat. The met station is expected to collect data for a period of two years. 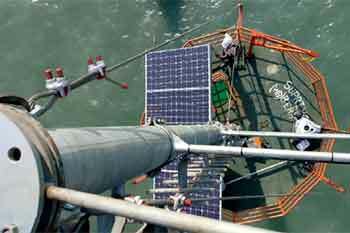 The offshore wind data collection platform is installed at about 16 kms from the shore in the territorial waters of Gujarat under the control of the Gujarat Maritime Board (GMB) at a water depth of about 11meters (w.r.t Chart Datum), where the tidal range is 4meters (m). The support platform is at a height of about 14m above water level. Gujarat Maritime Board (GMB) has provided the project with valuable insights about sea properties during various seasons, navigation routes apart from administrative permissions and facilitation. The unmanned met station will be powered by solar energy and will be remotely monitored for maintenance needs. Engineers will visit the site for general inspection periodically and cater to the servicing needs in case of a breakdown. Additionally, an onshore mast of 150m has also been installed for validation / correlation purposes.